Obituary – Freese, Shirley “Fern” (Moore) « Perry High School Alumni Association, Inc.
Fern Freese, 86, died at 9:05 p.m. Sunday, May 17, 1998, at Perry Nursing Home. Graveside rites will begin at 11 a.m. Wednesday at McGuire cemetery at Lucien. Rev. Tim Boggess and Dale Hirschman will officiate. Brown Funeral Home will be in charge of arrangements. Memorials may be made to the charity of the donor’s choice. Mrs. Freese was born July 12, 1911, at Lucien. She was the youngest of eight children born to Silas Bedford and Bertha Estelle (Vaught) Moore. As a child she lived on the farm her family acquired in the Cherokee Strip Land Run of 1893. She attended school at Lucien and Hayward. To get to classes, she rode horseback and sometimes had traveled by horse and buggy with her sister, Flossie. She took the train to Perry where she worked for her room and board while attending high school. 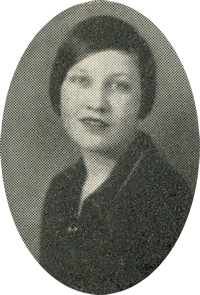 She was a 1929 PHS graduate. On Aug. 19, 1930, she and Henry Freese were married. They settled on a farm west of Perry, where they reared four children. She and her husband had been married 65 years at the time of his death. After her husband’s death, Mrs. Freese continue to live on the family farm for another five years before entering the nursing home. She was a quilter and a member of the Presbyterian Church and Whipple Ladies Aid. Among survivors are one son and daughter-in-law, Walter and Gen Freese, Perry; three daughters and sons-in-law, Elaine and Bill McLean, Choctaw, Nevalee and Jim Sewell, Guthrie, and Nevalyn and Gerald Stotts, Stillwater; eight grandchildren, Greg Hirschman, Dale Hirschman, Bryan Sewell, Evan Sewell, Darren Freese, Dayna Freese, Tammie Guzman and Dorinda Gold; and eight great-grandchildren.